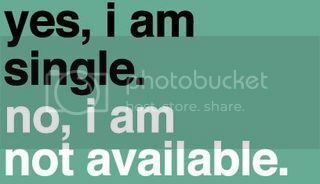 As an afterthought to my previous post on the limitations of Being Single, I think being single also has its own charm. There are many a plus being singe – be it woman or man. This is like a dossier to those on a constant look for love. Well, wait a minute, catch a breath, not every grass on the side is actually green, even if it appears green. Appreciate the present being, and you would be much happier. We have all been there when a very good friend has ditched us in favour of the new found girlfriend. Single people have the liberty to meet anyone without any prejudices from the significant other. You are free to catch up with anyone you would like to meet at any time. No Obligation. You automatically become a part of all the guy’s night out playing poker with beer in your hands. No regrets or guilt at all. And no nagging phone calls in the middle of a wonderful hand. You like that hot girl in red top at a party. Go ahead, flirt with her as you are what they say in Dilli – “Khulla Saand”. All this innocent flirting, in spite of being innocent can lead non-singles to enough heartburn. Singles are in no place to get into such awkward situations. Be what you are wherever you are! You want to read the book tonight, or want to watch the entire season 5 of Game of Thrones this Saturday? You can if you are single. You get all the me time and are free to spend it watching mindless TV or sleep all day. Your time, your wish. Nobody interferes. A good career opportunity but you would have to move cities? No problem. You can keep an auto yes mail with your boss. No questions asked, no need to discuss with anyone. It is worth the move, you move. No considerations! You like being awake all night and sleep all day. Please do. You hate the sight of the mall? You don’t need to go on that road itself. You feel like eating pasta early morning, you shall eat it. Your wish is your command, and no one else’s wishes are into consideration. You do what you want, whenever you want, in the way you want it! That’s it. No questions to be answered. Looking at it, Being single seems like a great situation to be in. Well, as they say, every coin has two sides. Whichever relation status describes you presently, that is the best thing that could happen to you. No grass is green, it is all pale. Accept it and move.